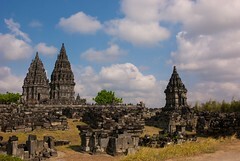 Archaeologists and geologists are still concerned with the threat of volcanic mudflow from Mt Merapi, combined with the rainy season damaging the temples of Prambanan. The mudflow has already destroyed several houses and structures and its path is projected to be close to, or near several ancient temples. 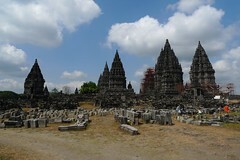 Recent heavy rains experienced in central Java may cause ash and rock to collect in the Opak River, which runs very near the Prambanan temples. Volcanic mudflow has already caused serious damage to buildings in localities around central Java, in some cases realigning the path of rivers and forcing mass evacuations.